Winter Weed Control: Maintaining a vigorous turfgrass stand will protect against weed infestation. However, during the winter months turfgrasses are not actively growing and are, therefore, susceptible to the encroachment of winter annual broadleaf weeds. Winter annuals germinate in the late summer and early fall months, live during the winter and die in the latespring or early summer with the onset of high temperatures. 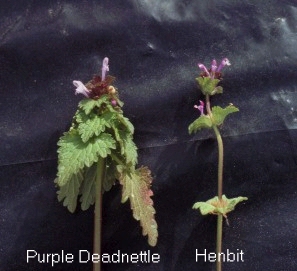 Examples include annual bluegrass, common chickweed, purple deadnettle and henbit. Controlling winter annual broadleaf weeds before they are able to set seed will not only reduce the likelihood of an outbreak the following year, but improve the aesthetic quality of the turfgrass stand. Control of winter annuals includes removing plants now by hoeing or hand pulling. Broadleaf herbicides can also be effective if used while the weed is actively growing or before the weed flowers in spring. Realize herbicides are not effective at cold temperatures. Generally postemergence herbicides are used when temperatures are > 50o F. Be sure to read and follow all label directions. Voles: Voles will make runways under lasting snow cover in lawns as they feed on grass blades and roots and are protected from predators. Damage is frequently mistaken as mole damage, but moles are not active during winter and actually tunnel below the soil surface. Vole damage appears as runways or winding trails of damaged grass. Lawns usually fill-in as conditions warm in spring. A winter without lasting snow is an excellent avenue of free vole control, as vole activity on exposed lawn areas will be greatly reduced without the protection provided by the snow.